Just yesterday I finished playing this game and I have to say, I loved it all the way through. 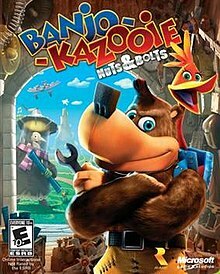 This game seems to get a lot of negative criticism from fans of the Banjo-Kazooie series; they say things like “Ah, Nuts & Bolts has ruined the series forever!”, “Rare is a terrible company nowadays” and “Grr, this game ruined my childhood!” but frankly, this objections seem ridiculous to me. I think one of the main problems people have with this game, is that it isn’t on a Nintendo console. A lot of fans of the game company Rare, are also big fans of Nintendo, as such, when Nintendo sold Rare to Microsoft, fans were very unhappy that their games would only be appearing on Microsoft’s consoles. It seems to me that people have probably seen trailers of this game, seen that it looks different and then immediately concluded that it is terrible without ever having played it. The fans probably just like to convince themselves that it’s bad so that they don’t feel like they’re missing out. Another thing people hate about this game is the fact that most of the characters have been redesigned. There’re no drastic redesigns, but all of the characters look a little bit different. Seeing as the first two games in the series were made for the Nintendo 64 and this one was made for the Xbox 360, it’s quite obvious that things are going to look different. The gameplay is quite drastically different from the gameplay in Banjo-Kazooie and Banjo-Tooie, and this is another thing which people seem to hate. I must admit, when I found out that the game would be more veered towards using vehicles than to regular platforming (like the first two) I was a little sceptical and I worried that this game might actually turn out to be awful. However, the vehicle side of this game is fun! You have to do missions to proceed in the game and they’re given to you by a variety of characters from the past two Banjo-Kazooie console games and a few new ones too. These missions vary dramatically in terms of difficulty and content and for all of them you’ll need to use the vehicle best suited to the task. For some missions you’re given a vehicle to use, but for about 90% of them you choose your own. There are lots of vehicles that you can buy from the character Humba Wumba, but you can also build your own. Let me give you an example of something which might happen in the game: you start a mission which is just a basic race around the map so you choose one of the cars you’ve bought and start the race. Unfortunately, it seems that all of the other cars are much faster than yours and you’re not likely to win. As such, you take the car to the workshop, attach a couple of plane jets, or something, to it, and then you can go much faster than all of the other cars! The gameplay is just very fun, and while it is different, it’s still just as fun as the other two. Plus, I want to add, that the difference between gameplay in this is no greater to the difference between the gameplay in Super Mario Bros. and Super Mario Galaxy, and the Mario series isn’t criticised very often for it’s changes. Plus, this game is full of funny dialogue, beautiful graphics and scenery, lovely orchestrated music and hundreds of references to old Rare games. This is just an all-round good game. You get the nostalgia due to the similarities to old games, but at the same time it’s doing something new and daring.